If you're thinking that four might be a bit young for the game, then sure, I hear you, and I imagine he'll probably spend a lot of time teaming up with Mummy or Elizabeth, trying to defeat Big Bad Daddy, before eventually plowing a lone furrow once he's mastered the basics. This got me thinking - in a 'family' game, is it possible to know too much? Is it possible to squeeze all the fun and pleasure out of the game by becoming too good at it? Should you, if possible, remain somehow a 'lesser' player in a bid to keep the atmosphere light? Or are you just cheating the other players just as badly by deliberately playing poorly as by working everything out as if your life depended on it? 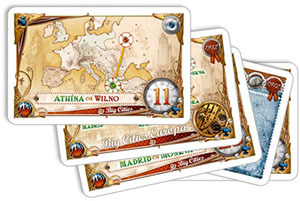 What follows are a few ways in which you can improve your chances of winning in a game of Ticket to Ride. I don't have an answer for you about whether or not you should give yourself this information. What I do know is that this is one of those 'genie out of the bottle' moments. 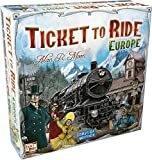 Once you start thinking about a harmless game like Ticket to Ride in a cut-throat fashion, your only choices from that moment forward are to consciously get better, or deliberately stay at the level you currently are, letting Lady Luck and casual in-the-moment thought dictate your play. At the start of the game, newer players are always peering at the board, trying to look for their destination start and end points. Some will even point to the board while they do this. If you already know where everything is, you can avoid giving away useful information to your opponents. Furthermore, you can spend less time worrying about where your destination cards are, and concentrate on your opponents, leaving you ready to spot exactly the kind of behavior I've outlined, giving you an edge. If you want to take this further, deliberately making a show of looking at a particular city, tracing a part of a route that has nothing to do with your own, can be a smart move, although this works a lot better among strangers who may be too ready to suppose that you're an idiot, rather than a regular playgroup who already know you're a Machiavellian soul who would sell their grandmother's kidneys for an edge. On the face of it, this is easy. 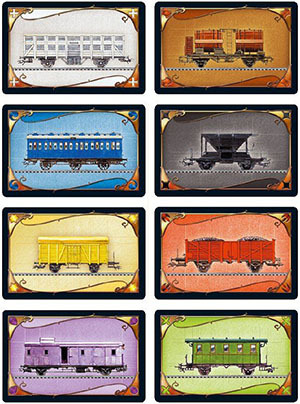 There are a bunch of cards in the different colors, plus some wild Locomotive cards, which can be used as any color you like. Trying to correctly value the cards as they pertain to your chances in the game is a skill that varies widely between players. There are many, many edges you can get over opponents in this area of the game. First, what colors have they been taking? What cards were they excited to see arrive on the row? If they seem to be collecting particular colors, what does your knowledge of the board tell you about their likely destination routes? Every time an opponent takes a face-up card, you're receiving free information. Use it wisely. Most players at a casual level believe that there's nothing to do while they wait for their next turn. Competitive players know that the game is most often won on opposing turns, as you correctly identify their strategies and goals. Equally, if you're playing against good players, there's definite strategic value in drawing blind from the deck, rather than letting them know what you're collecting. Take it to the next level beyond that, of course, and you might deliberately take a color card to mislead, or simply to deny an opponent a card in the color they were collecting. The next bit needs a lot of mental work, and unless you're a very, very serious gamer, you're rarely going to be able to execute this. Nevertheless, there are very, very serious gamers out there, and you can bet that if it matters enough to them, they'll be doing this. 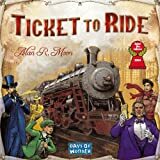 Having a strong knowledge of probability is a good weapon in a gamer's makeup, and Ticket to Ride allows the mathematically aware player to gain a steady stream of small edges. First, you have to keep track of how many of each color wagon have gone. Then work out what your chances are of drawing them from the deck. Sometimes you'll discover something very useful. For example, suppose you're trying to get a group of four cards together. You have three of one color, and two of another. Logically, you're trying to collect the one you're only one away from finishing. If you've counted carefully, you may know that there's only one of that color left in the deck, while there are many of the other color. At that point, you might take that second color from the row, knowing that you're more likely to see that color on subsequent turns. Remember, every card drawn from the deck changes the probability of any given color coming up next. The differences are often subtle, but so are the margins of winning and losing. This is probably the single most necessary upgrade in your playing level if you want to win more often. If you don't know where your opponents are going, how can you stop them? There are only so many routes that they could possibly have picked, and you need to know what those were. There's also a psychological aspect to this, since some players are notoriously reckless, and you can be almost certain that they're looking to go 'coast to coast', while others always spend their time completing the smallest routes they can find before selecting more. Without too much trouble, it's easy to track down a complete list of all the destinations, including how many leave from each city, and how many points those routes are worth. Once you've fully internalized that information, you're in a much better position to decide which tickets to take at the start of the game. While others may choose Los Angeles tickets because their name is Larry Andrews, you will only take tickets from there if you're ready to fight over the many routes that need LA as a destination point. If your play style is one of quiet development, rather than being in the thick of things, knowing the destination cards is a way to know exactly where the underpopulated portions of the map are going to be. This knowledge is also usable in a less-than-friendly fashion. Although the game board is beautifully designed to allow for a fair amount of leeway before total disaster occurs, there are nonetheless pressure points which can quickly turn route planning into a logistical nightmare, and the reason for that being true is because of the distribution of the destination tickets. Only cares about getting the longest route. Only cares about cities they've visited, or has 'pet' routes from previous games. Wants to end the game as quickly as possible. Isn't interested in completing routes themselves, just wants to scupper everyone else's plans. Very quick off the mark, and transparent. Likes to think of themselves as inscrutable. Revels in small victories, and wants to show they're smarter than you. Doesn't care about winning, just cares about beating big sister. Of course, several of these attributes can apply to the same opponent - we're complex creatures, after all. Understanding why your opponents are playing can give you a valuable insight into what destinations they might be trying for, how vulnerable you should make yourself by going for more and more high-end destinations, and how quickly the game is going to play out. For you to win, everyone else has to lose, and using their own preferences against them is a prime way to do this that has very little to do with luck, and everything to do with your understanding of the human condition. So, if you choose to pursue some or all of this knowledge, you can't fail to get better at the game. You'll win more often, be caught out less often, rarely be surprised at what your opponents were trying - and hopefully failing - to complete, and win despite Uncle Barry getting the longest route for the eighth time running. If you want to, all that can be yours. 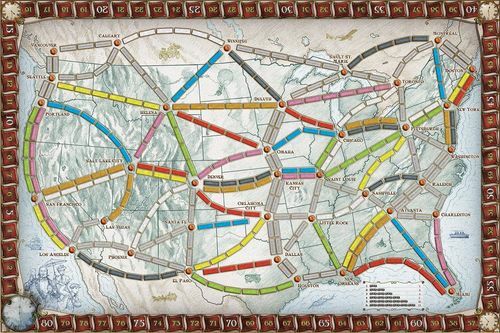 However, I would argue that part of the charm of Ticket to Ride is the ability to be beaten at the last by someone claiming the longest route on the last turn, thus completing their epic route between two cities. I would argue that finding a black wagon on top of the deck right when you need one is a lot more fun when you don't know that there's been only two of them seen so far in the game, and that therefore your probability of drawing one has increased by a percentage point or two. I would argue that it's just as much fun to complete a route unopposed between two undervalued cities, even if you don't that they're undervalued, as to complete in a fiercer zone.